We see a lot of houses, some are up to date while others have been left in their original condition. Occassionally, we come across a home that has been meticiulously re-designed adding form and function within its walls. From the moment I saw this adorable house on Mono amid construction, I was excited to get my hands on it. I watched as they crafted the architectural details to bring some old world charm to this re-designed home. Once the construction was completed, I was able to take in all of the work these gentleman had done to take this house and make it ready to be a home. One of my favorite details being the trim added to all the windows and doors that reminds me of the craftsmanship we see in our 100-year-old shop. In a world of fast and furious construction, little details like this tickle me to no end. 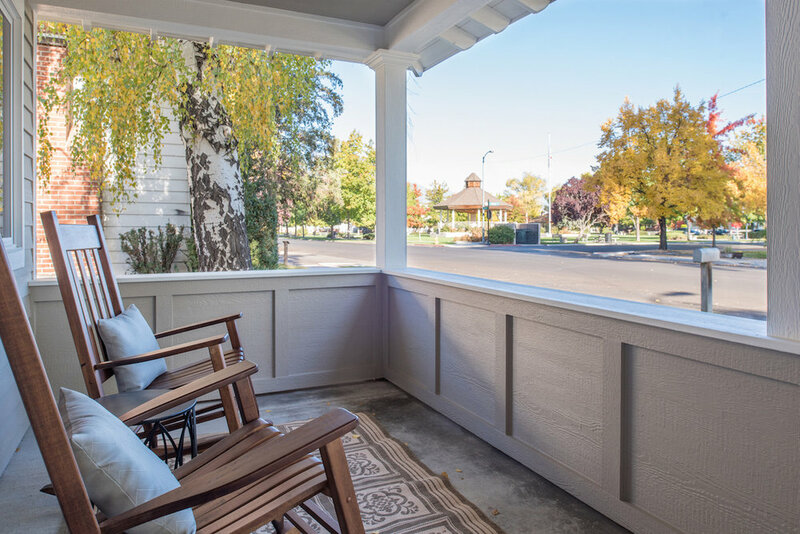 First things first, the front porch: walking up you can imagine yourself sitting on the front porch sipping your morning coffee and waving to your neighbors as they walk by on their morning stroll. Nothing epitomizes that small town feel like a front porch. The oversize picture windows overlook Minden Park framing in one of the most beautiful vantage points in our town. Now inside this brings me to my second favorite feature of this gorgeous home: open floor plan. The livingroom boasts enough space for lounging and includes a nook that's perfect for sitting down with your favorite book or creating an in-home office. Entertaining is easy with a beautifuly laid out kitchen that includes a breakfast nook. Barstools make it easy to visit with guests while preparing some tasty eats on the brand new stainless steel appliances. The dining area welcomes you to sit and enjoy a beautifully prepared meal and make lasting memories with the best of friends. Onto the Master Retreat, a lovely space for the sweetest of dreams with an attached master bathroom with a double vanity, water closet, walk-in shower and walk-in closet. Living is easy in this home. If you'd like to stop by and take a look at this gorgeous place give Devin Murphy a call to setup your own private showing (775) 450-7599.